Product #46035 | SKU 705P | 0.0 (no ratings yet) Thanks for your rating! 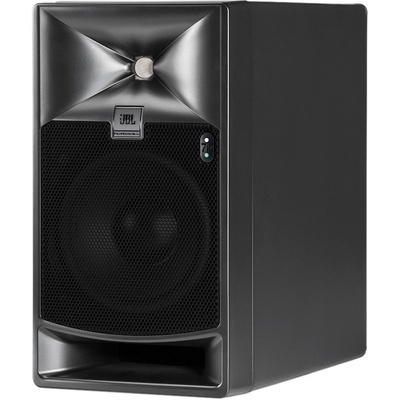 The single 7-Series 705P 5" Bi-Amplified Master Reference Monitor from JBL is a self-powered reference monitor for critical music recording, film post, and broadcast-production applications. The speaker features JBL's popular Image Control Waveguide but with a smaller footprint and can be used to deliver and expansive soundstage, with accuracy in a broad range of rooms. The 2409H high-frequency compression driver incorporates a low-mass, annular diaphragm to deliver smooth response beyond 36 kHz with very low distortion. The 725 G low-frequency transducer provides 14 mm peak-to-peak excursion with greater linearity, delivering low-frequency output below 39 Hz. The drivers of the 705P are offered to deliver two to three times the output of existing studio monitors. Furthermore, JBL's Image Control Waveguide ensures accuracy and neutrally while providing a wide sweet spot with increased sonic detail. The speakers dual-amplification system features a 120 W amp for the 2409 H high-frequency transducer and a 250 W amp is dedicated to the 725 G low-frequency transducer. This combination provides better output and allows greater listening distances, which is suitable for post-production or mastering environments. Finally, the speaker also features on-board room equalisation for compensating for adverse effects of room acoustics. In addition to twelve bands of Room AEQ, eight bands of User AEQ allow for customised response curves when placed behind a perforated cinema screen. User-enabled digital delay allows virtual alignment of speakers relative to the listening position, while additional AV Synchronisation delay is available to compensate for latency in video displays. Integrated dual-amplification system with internal floating-point DSP. Compact enclosures for easy placement and installation. JBL 725 G low-frequency transducer delivers low-distortion and high SPL. JBL 2409 H high-frequency transducer with low-mass annular diaphragm. 2-channel Class-D amplifier HF 120 W / LF 250 W.
192 kHz, 32-bit floating-point processing. 12 bands of Room AEQ, 8 bands of User AEQ. 6 factory presets, 6 user-defined presets. 18 milliseconds of Room Delay, 150 milliseconds of AV Sync Delay. 1 x XLR-1/4" balanced combination analogue-audio input. 1 x XLR AES3 format digital input with 1 x XLR pass-through output. Digital input accepts sample rates of up to 192 kHz. RJ-45 network connection for Harman HiQnet connectivity. Rear-panel multi-function controls and LCD display allow selection of input sensitivity, input trim, Room AEQ, User AEQ, Room Delay, AV Sync Delay. Top, bottom, and rear mounting points; birch plywood cabinets reinforced for safe mounting.